Another planning application for a change of use for Micky Flynn’s Pool and Snooker Hall has been submitted by the owners. This one is in two parts, a change of use from leisure to retail and for a change of use from leisure to more generalised uses (we are assuming this has been done if the first application is unsuccessful). 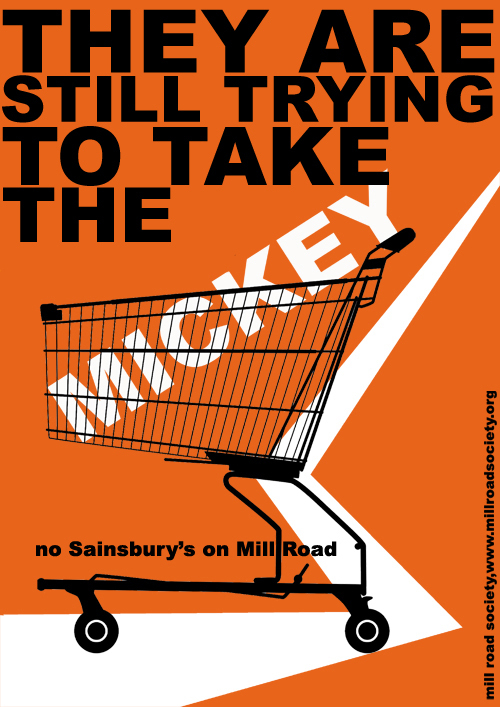 Although this application has been made by the owners of Micky Flynn’s and Sainsbury’s or any other large multinational corporation is not mentioned I think it is safe to assume that a supermarket in one form or another will appear on Mill Road if we do not lodge our objections to this application. Below is a copy of a letter sent to local councillors for Romsey and Petersfield and we are currently drafting a offical planning objection template to be sent out any one who is interested in lodging a complaint about this application. Those of us who have put in comments of objection to previous applications for very broad and unspecific change of use for this Pool and Snooker Club, have very recently received two notices of further planning applications. As you will be aware, these current applications are once again seeking broad and unspecific change of use for this Pool and Snooker Club. Such proposals do nothing to protect the character of the area, including ‘Mill Road’s characteristic smaller independent traders’ (recognised in the Cambridge Local Plan as a key feature of the area), or to ‘safeguard the independent, cosmopolitan feel of the street’ (Policy 23). The Local Plan recognises that ‘Mill Road is an extremely busy, narrow road and there are conflicts between cars, buses and cyclists. In places, the pavements are narrow and cluttered with signs, lampposts and parked bicycles, making it difficult to move along them, particularly with a pram or wheelchair’. A broad, non-specific application of this kind poses the risk of conflicting both with the recognised character of the street and with the need to address the serious road safety problems – as the Planning Inspector recognised when they threw out the previous application of this kind last year. Previous applications for change of use for this venue have already been strongly rejected, and Mill Road Society continues to be very concerned by these applications. All evidence previously submitted, as well as the petitions we have gathered tell us that a change of use for this building is an issue which will greatly concern both traders and the wide community of Mill Road. We will be submitting our objections and would draw your attention to the implications of these applications for all of Mill Road, as well as community objections to those implications. This entry was posted on Sunday, July 6th, 2014 at 11:38	and is filed under Uncategorized. You can follow any responses to this entry through the RSS 2.0 feed. You can leave a response, or trackback from your own site.